Say’s law states that the production of goods creates its own demand. In 1803, John Baptiste Say explained his theory. 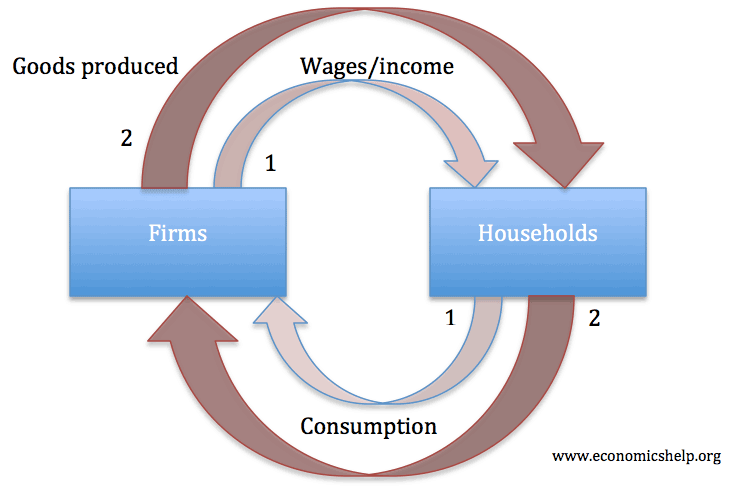 This view suggests that the key to economic growth is not increasing demand, but increasing production. Say’s views were expanded on by classical economists, such as James Mill and David Ricardo. Why does supply create its own demand? If a businessman produces a good, then he will be keen to sell it. This production creates wages for workers and income for the businessman. Therefore, the production has increased wealth and leads to demand for other goods. Say argued it was irrational to hoard money because ‘he is most anxious to sell it immediately, lest its value should diminish in his hands‘ i.e. inflation may reduce the value of cash. This theory assumes that markets clear and that businessmen produce goods that are demanded by the market. If firms produce $1 million worth of goods. They will be paying $1 million of wages to households. In turn, the households can buy $1 million worth of goods produced by firms. If firms now double production to $2 million worth of goods. They will also be paying $2 million of wages to households. In turn, the households can now use their increased wages to buy the increased production of goods. This is very simplified. It ignores saving and investment, tax/government spending and exports/imports. It also assumes firms pay all their profit to households. But, gives a conceptual understanding of how increasing production creates the goods which will be desired, and also creates the additional income which can be used to buy the goods. The economy should always be close to full employment. There shouldn’t be demand deficient unemployment. According to classical economists, any unemployment must be due to wages being artificially kept above the equilibrium level or structural factors, such as, lack of skills in specific industries. To increase output, we should concentrate on increasing production rather than demand. The mass unemployment and prolonged recession of the 1930s suggested that production does not equal demand. In a recession, there can be insufficient aggregate demand for goods produced. Excess savings. There are examples where there is an increase in savings, and businessman and consumers hoard cash. See: (Paradox of thrift) Say himself criticised Ricardo for neglecting the possibility of hoarding if there are insufficient investment opportunities. Liquidity Trap. In a liquidity trap, the demand to hold cash is greater than the demand to spend. Banks increase their reserves and the saving rate increases, this leads to a fall in aggregate demand. Confidence. In certain circumstances, people may not have the confidence to spend and invest. They may become risk averse and hoard cash in unproductive savings. It may be very rational to ‘hoard’ money – especially in a period of deflation or anxiety. The balance sheet recession of 2008-12, illustrated an example of where banks, consumers and firms were keen to pay off their debts and not spend all their income. This led to a prolonged recession. If Say’s law doesn’t hold true, it may be necessary for government intervention to break the cycle of falling aggregate demand by utilising the hoarded savings. For example, expansionary fiscal policy or printing money to create demand. Austrian economists hold that in the absence of distorting government behaviour, Say’s law should hold true. However, if government cause credit booms and busts through artificially changing interest rates, this can cause disequilibrium.